I was recently asked my medical thoughts on pubic hair and if it truly served a purpose. I am highly aware of the trends today, and have learned that 95% of women are assumed to alter their pubic hair by trimming, shaving, or removing it completely. Over the last two decades, our society has gone from trimming the bikini line to believing that the entire labia and pubic region must be bare to be clean. This is, of course, not accurate. While research on this exact topic is hard to come by, there are enough studies and research articles to connect the dots. A 2000 study found that after 4 months of dietary supplementation of selenium, the mercury levels found within the pubic hair of those with low selenium levels dropped by 34% and increased selenium levels in the hair by 73%. This study alone should trigger further cause for research on the true purpose of pubic hair, as these researchers found that pubic hair is connected to the minerals naturally occurring or being supplemented into the body. Further research links pubic hair to providing the pheromones that attract a sexual mate in life. Every person has an almost undetectable and different hormonal smell, and the pubic hair seems to capture and allow this scent to be utilized as it was meant. Pheromones are the hormones linked to sexual attraction. 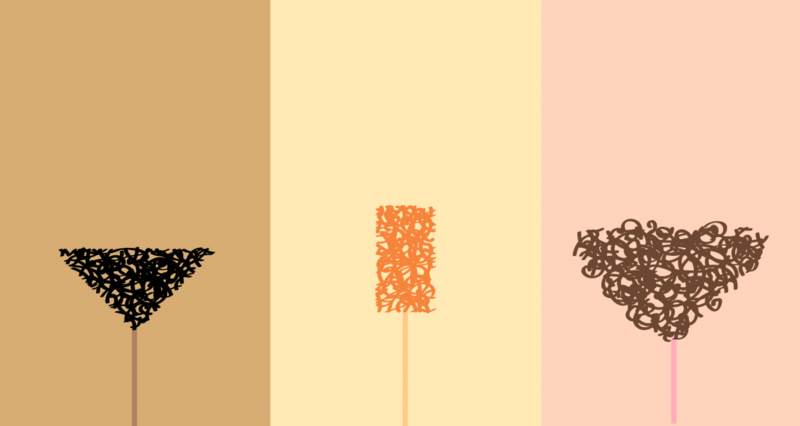 Pubic hair is also a sign of maturity, as it occurs throughout puberty. But is does not reach its adult-status of maturity until well after puberty has occurred. The area starts smooth and then develops very fine hairs. These hairs spread over the pubic region, but do not reach the thighs until much later. It has been suggested that once the pubic hair reaches its mature state that it signifies sexual maturity. If one links this theory to the facts known about pheromones, it can be understood that the pubic hair plays an important role hormonally. Testosterone and estrogen (in men and women respectively) increase significantly throughout puberty, triggering pubic hair growth, and level off over the course of a few years. Just because the hormones find a balance does not mean that the pubic hair’s purpose is complete. Research has found that removing the hair leaves the follicles susceptible for infection and places individuals at a greater risk for chronic irritation. This irritation, combined with the warm, moist environment of the genital area provides the perfect breeding ground for bacterial pathogens such as methicillin resistant staph aureus (MRSA). It has been found that staph boils needing drained due to infection are more common on shaved pubic areas than un-shaved. What is even scarier is that doctors have found staph infections spread from a shaved-person with a boil to the shaved-partner’s skin without ever developing a boil. This is known as cellulitis. It can also be believed that freshly shaved pubic hair follicles are left as tiny open wounds, which leaves them more susceptible to herpes and other sexually transmitted infections. There is one other reason to let pubic hair be, and that is simply because it is a friction barrier. When skin rubs together, or against certain fibers, it can cause burning, inflammation, and pain. The hair presents a cushion and breaks the friction, keeping the area soothed and happy. After digging up everything I could find on this topic, I am here to tell you that your pubic hair does indeed have several purposes, and that by removing it, you are not cleaner or healthier. If anything, you are putting yourself at risk of infection and inflammation. "All I can say is Dr. Brenda has seen me through some of the biggest events in my life. When I first came to Dr. Brenda in October, 2011 I was having pain in my entire back from working in retail. On my first visit we discussed other concerns and I had mentioned that I was getting ready to start our 2nd IVF treatment. She started to explain how chiropractic care can help with preventing illnesses, infertility, pregnancy, and child birth. It was interesting that she noticed my pelvis was rotating which could present problems during pregnancy and delivery then we discussed how the different back muscles and abdominal muscles work together to support you during pregnancy and how it helps increase blood flow to the uterus. I had never heard that chiropractic care could help with infertility or that you could receive treatments during pregnancy. Dr. Brenda even discussed the benefits of using acupuncture along with the chiropractic treatments to help with the stress of IVF and also to also help with blood flow to support a pregnancy."